Skip messing with raw dough and use ciabatta bread for this grilled pizza. 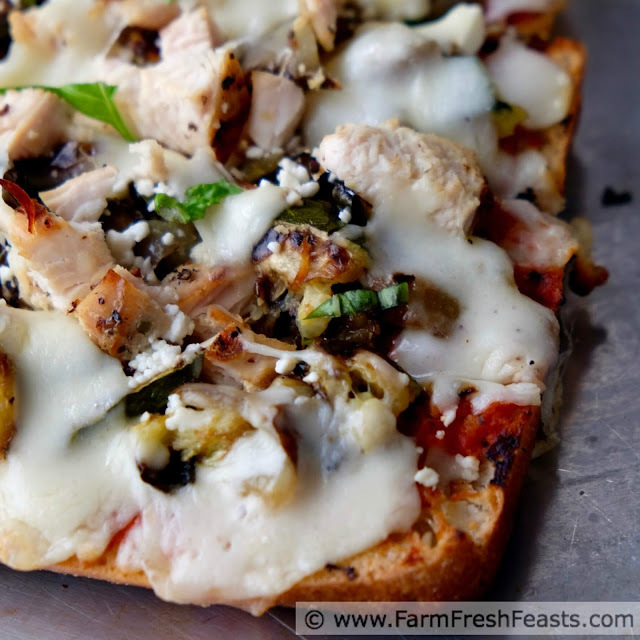 Topped with grilled chicken, eggplant, peppers and zucchini, this flavorful pizza comes together quickly and keeps your kitchen cool. 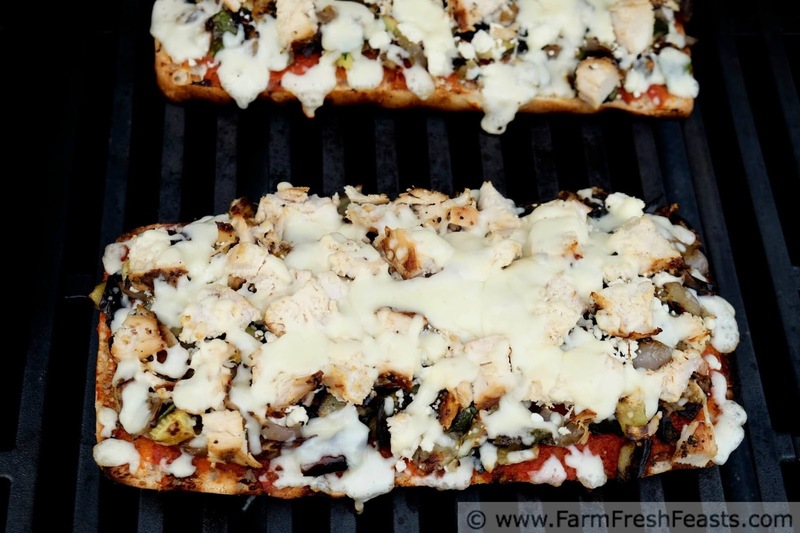 This pizza is an easy one to throw together during the summer. 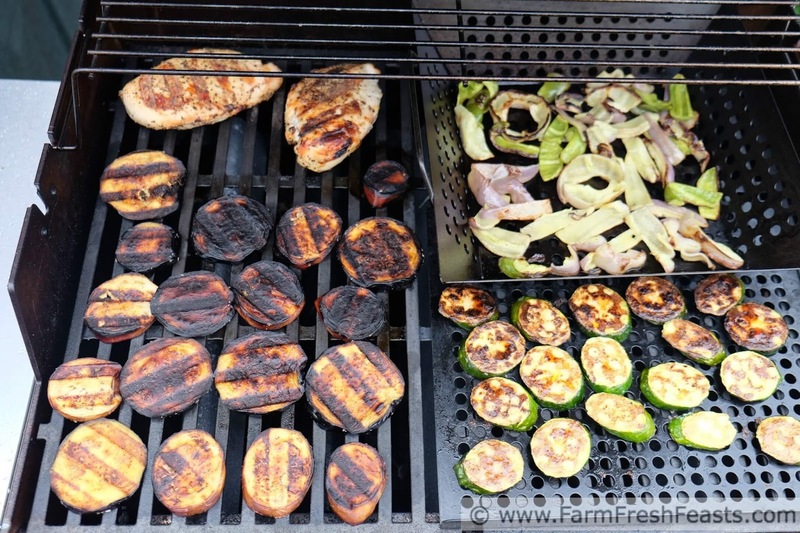 It uses previously grilled zucchini, peppers, eggplant, and chicken. These are combined with feta cheese and mozzarella, then used to top a grilled ciabatta loaf. I topped it with fresh basil for a real summer treat. It's a common theme, for me, to use what I've got on hand for our meals. During the growing season I am using what I've got from the Community Supported Agriculture (CSA) farm share. During the colder months I'm using whatever I've put up--by freezing, dehydrating, or canning--combined with whatever looks good on sale at the grocery store. Always I'm hoping to cook once and eat twice--repurposing leftovers into new meals. Cooking extra while I am cooking, so I can save a step. This recipe is no exception. 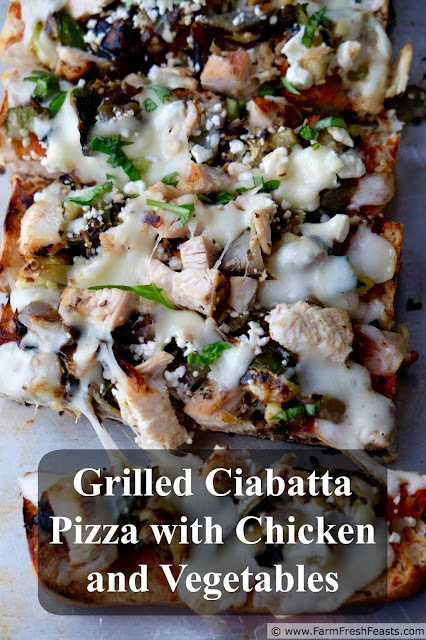 I'm using previously grilled chicken and vegetables, added to a take & bake ciabatta loaf, for our Friday Night Pizza. I've got a couple of 'go to' techniques I use to deal with an influx of vegetables. In the Spring I'm going to prep greens and have all our favorite salad toppings handy so I can make salads in a jar. In the summer I will toss sliced vegetables with oil, salt, and pepper and throw the farm share on the grill. In the Fall I'm more likely to put those vegetables in a roasting pan. Either way of cooking brings out the sweetness of fresh vegetables and gives me some building blocks for future meals. Once cooked, I'm using these prepped vegetables in omelets and on pizza. That's a couple of meals out of one session of prepping and cooking vegetables. It's much easier to figure out what to make for dinner, or breakfast, if I've got a meal component ready to go. Since my family loves our Friday Night Pizza Nights, I'm always planning ahead to our next pizza night. Like I describe in My Pizza Primer, saving a half cup or cup of one night's dinner aside results in a building block for pizza later in the week. 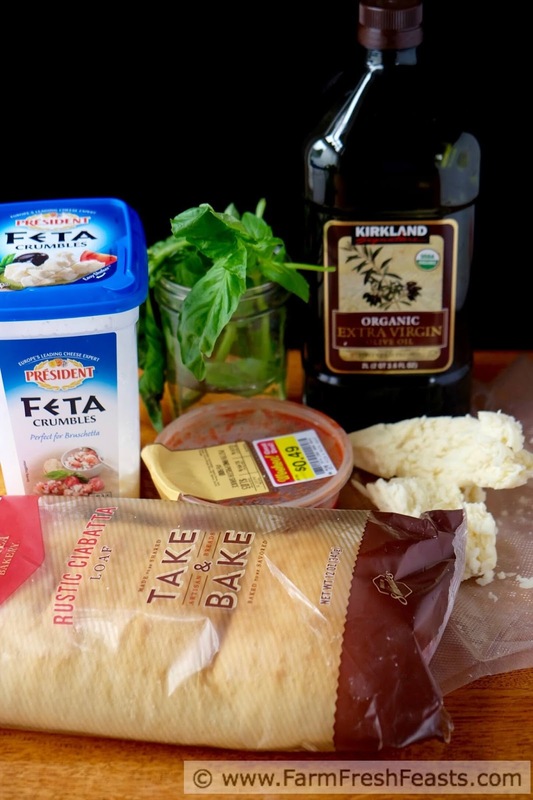 It's also a terrific idea to have an assortment of cheeses on hand, so I often have feta and mozzarella, or goat and fontina, or cheddar and a blend handy. 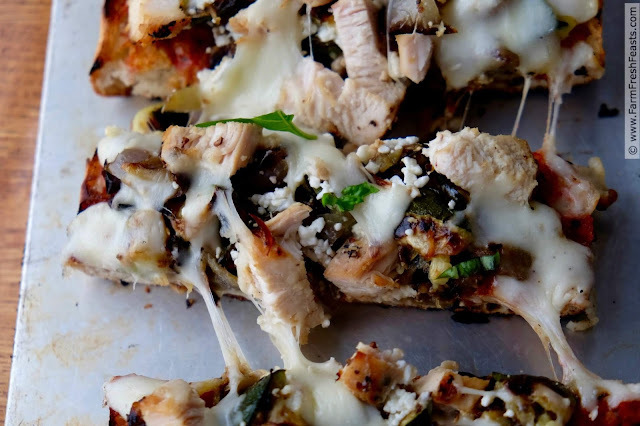 For more ideas for your Pizza Night, please see my Visual Pizza Recipe Index. Because I like to categorize things, I've got it broken down into Vegetarian Pizzas, Pizzas with Meat, Pizzas with Seafood, and Savory Pizzas with Fruit. For more recipes using eggplant, please see my Eggplant Recipes Collection. For more recipes using Peppers, please see my Pepper Recipes Collection. For more recipes using zucchini, please see my Zucchini Recipes Collection. These collections are part of the Visual Recipe Index by Ingredient, a resource for folks like me eating from the farm share, the farmer's market, the garden, the neighbor's garden, and great deals on ugly produce at the grocery store. (This is for a gas grill). Preheat grill to medium heat. Slice ciabatta in half lengthwise (your bread knife parallel to the kitchen counter) and brush the cut side with olive oil. Grill the bread, cut side down, for about 3 minutes in a closed grill. Remove from grill and take your time. This does not need to be a "working quickly" type situation. Brush the top and bottom (the uncut sides) of the bread with oil. Flip the brushed side onto a piece of parchment or a cutting board--something to keep your counters clean while you work on the cut side of the bread. Spread prepared pizza sauce on each half of the grilled bread. 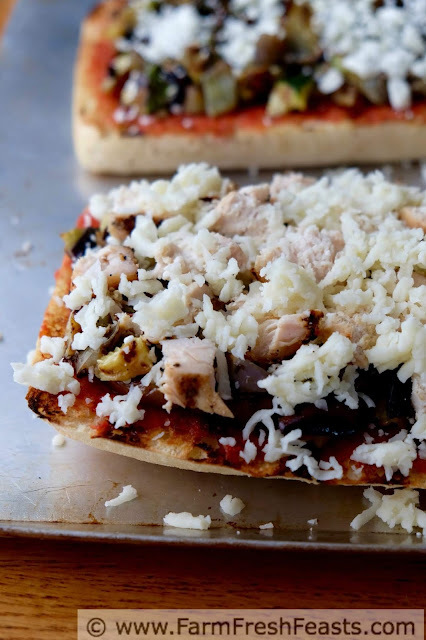 Top the loaves with chopped vegetables, chopped chicken, feta cheese and mozzarella--distributing the amounts equally between the 2 halves of bread. Add dried seasonings. Return to the medium grill, close the grill, and heat for 3 to 5 minutes until cheese is melted. You want to err on the side of too little, because the longer you cook the more chance for the bread to burn. It may work to turn off the grill right before adding in the topped pizza so the air temperature cooks the pizza as the grill cools. Remove from grill, top with fresh basil, slice, and serve. You bet! I was glad to use leftovers and glad it turned out so well. Now I am craving burrito bowls--I had a tasty one at the US Space and Rocket Center in Huntsville, Alabama (of all places) and another terrific one in Cocoa Beach and now they are back on my radar. Actually, this is one of my favorite meal during the time that I work in the business firm last few months ago. I just like to thank you for giving this good recipe of grilled ciabatta pizza with chicken!